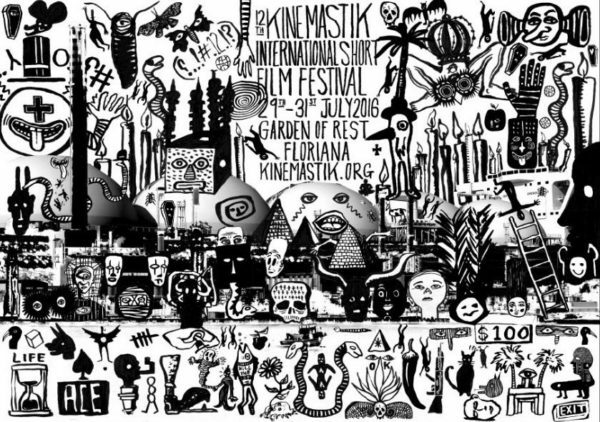 The 12th edition of the Kinemastik short film festival is an open-air treat in Malta’s summer cultural calendar. It takes places over one weekend (29-31 July) at the enchanting Garden of Rest in Floriana. A hand-picked selection of award-winning shorts from BERLINALE, TORONTO, ROTTERDAM, LOCARNO, CANNES, SHEFFIELD (festivals) can be enjoyed over Friday and Saturday, with Sunday night focusing exclusively on short films for kids, aged between 4 – 13. Giant effigies of Pope John Paul II, smashing of ceramic frog statuettes, free falling through space, a most unusual menagerie of animals where fish can’t swim and possums can’t run… these are just some of the wondrous visual delights to be enjoyed with films sourced from North Korea, Chad, Myanmar, Georgia, Belgium, Poland, Romania, Hungary, Algeria, Portugal and Malta, running alongside works from the UK, USA, Canada and Germany. Four hours of programming will provide a mixture of documentary, fiction, drama, comedy and experimental shorts running over two nights, with a second experimental screen, Neck of the Woods, running simultaneously. This year’s jury consists of producer Katryna Sammut Tagliaferro, actor Paul Portelli, writer Alex Vella Gera and filmmaker Joe Spray who will decide which film will receive the Golden Dot Award. There is also an audience award in which members of the public vote, so be sure to cast yours! The infamous Kinemastik Afterparty will be happening right there at Garden of Rest on both Friday and Saturday nights. This year, our eclectic bag of troubadours consists of Dean (Mute/UK), Capitol K (Loose Meat/Whipped Cream Records/Total Refreshment Centre/UK), Uncle Al (Uncle Al’s Records/The Go-Off/UK), Steph VR (Le Gun/UK), TVM(BE/MT), Jon B (PMP/Valletta) and more. We would like to thank our sponsors: Malta Film Commission, Malta Tourism Authority, Aldo, Marks&Spencer, AP and Din l-Art Helwa. Programme details and directions on how to find the venue, visit www.kinemastik.org. Next Post August shutdown: all Malta goes on holiday?